BEIJING - Eight years ago, Zhai Tiantian left China to pursue higher education in the United States. Three days ago, the doctoral candidate returned to his home country with a tag of "potential terrorist" on his head. Zhai, 27, a former student at the New Jersey-based Stevens Institute of Technology, was doing his PhD when the university suspended him in March, citing major violations of the code of conduct for students as the reason. Zhai hit the headlines in the American and Chinese media following his arrest on April 15 on charge of terrorism. The university reported to the police that Zhai made a phone call threatening to "burn down the university building" - an allegation Zhai vehemently denied. "I never threatened to burn down the school building," Zhai, a native of Xi'an, capital of Shaanxi province, told China Daily in Beijing. He said that a verbal dispute with Joseph Staley, the assistant vice-president of the university, led to the controversy. "He questioned my financial situation and was looking for an excuse to kick me out of school," Zhai said. On April 14, Zhai received a letter from Staley. "It said that I was to leave the US in a week and that my student visa would be revoked," Zhai said. "So, I called the school the following day, and my exact words were: 'I am going to burn Stevens (Institute of Technology) to the ground in the media and court.' They took what I said out of context. "I never threatened to burn the school to the ground or hurt anybody." The next day, the campus police arrested him, while immigration authorities revoked his student visa. Zhai spent the following four months in jail, which, he said has left him bitter. "In the first month and a half (in jail), I was refused any contact with the outside world and was given very little food. There was not a single white prisoner there. Bullies robbed my food and beat me when I resisted, leaving my body bruised," Zhai said, pointing to a wound on his right hand. "Thankfully, an inmate, who was in jail for two weeks for drunk driving, helped me send a message to Wang Meiying, a restaurant owner I once worked for." Wang hired a lawyer for Zhai and informed his parents, who run a business in Central China's Hunan province. "In the latter half of my imprisonment, my lawyer Hai Ming and Wang came to visit me regularly. They also deposited some money in my account, which I could use to buy instant noodles in jail," Zhai said. "My lawyer told me that many Chinese students in the US, who had disputes with their schools, risk having their student visa revoked, being put into immigration prisons or even being deported to China." After two and a half months in the Hudson County Correctional Center, Zhai was moved to the Elizabeth Detention Center, where suspected illegal immigrants are held. On July 28, Zhai appeared before the New Jersey Superior Court, where mediation between lawyers and the judge freed Zhai of the charge of making a terrorist threat. But the court slapped him with a charge of disorderly conduct, which Zhai also denied. A week before Zhai's appearance at the New Jersey court, another charge of aggravated harassment against him was dismissed by the New York County District Attorney's Office. Zhai left the US on a voluntary departure granted by the federal judge of the immigrant court on July 29. 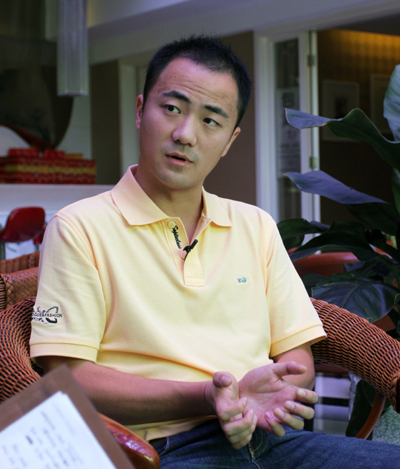 "I missed my parents a lot in jail," said Zhai, who had not seen his parents for eight years. "I cry every night even after coming back to China. I don't know what's on my mind but I feel angry at the ordeal I endured in the past months. "But I am ready to go back to the US to prove my innocence if the New Jersey Superior Court opens the case." Zhai said his idol is Martin Luther King Jr, an iconic figure in the history of American liberalism, best known for his dedication to civil rights. "I like his 'I Have A Dream' speech. I admire him because he motivated black people in the US to stand up and win political recognition," Zhai said.